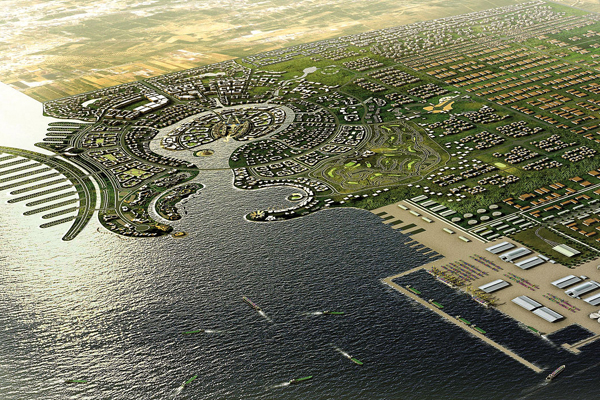 An artist's impression of Jazan Economic City. Saudi Aramco, Air Products, and Acwa Power have announced the signing of a term sheet to form a gasification/power joint venture (JV) located at Jazan Economic City (JEC) in Saudi Arabia. The JV will purchase the gasification assets, power block and the associated utilities from Saudi Aramco for approximately $8 billion. These assets are currently under construction and will be transferred to the JV upon successful start-up, scheduled in 2019, said a statement from the company. The JV will own and operate the facility under a 25-year contract for a fixed monthly fee. Saudi Aramco will supply feedstock to the new venture, and the JV will in turn produce power, hydrogen and other utilities for Saudi Aramco. Air Products will own at least 55 per cent of the JV, with Saudi Aramco and Acwa Power owning the balance. The JV builds upon the importance and recognition that critical infrastructure assets in the region are being developed and operated under the public private partnership (PPP) model. The consortium will increase job opportunities and transfer the most advanced technologies in this field to the kingdom, and enable Saudi talent to employ this technology for the first time, said a statement from Saudi Aramco. The JV will serve the Saudi oil giant’s Jazan Refinery and terminal at JEC, a megaproject that will process heavy and medium crude oil to create liquefied petroleum gas, sulphur, asphalt, benzene and paraxylene, and add 400,000 barrels per day of refining capacity. Saudi Aramco senior vice-president of downstream Abdulaziz M Al Judaimi pointed out that the Gasification/Power JV would be central to the self-sufficiency of its megaprojects at Jazan. "It will enhance the overall value of the refinery and integrated gasification combined cycle power plant, and aid in transforming the province by positioning JEC for additional foreign direct investment and private sector involvement,” stated the top official. Air Products chairman, president and CEO, Seifi Ghasemi said: “We are very honoured to be given this outstanding opportunity to expand our involvement in this megaproject in partnership with Saudi Aramco, the world’s largest company, and Acwa Power, the leading private power producer in the Middle East." Earlier this year, Air Products had acquired the patents for the Shell liquids gasification technology, which is the core technology for the Jazan gasification facility, he explained. "Building on the success of our Lu’An project in China, this new project further extends Air Products’ leadership position supplying syngas to major companies around the world. We appreciate the trust that Saudi Aramco continues to place in us, first in awarding us the air separation unit, and now moving toward an expanded scope of supply at Jazan," he added. Ghasemi noted that the JV furthers the efforts of the PPP model to develop critical infrastructure assets in the region, a key component of the Kingdom’s Saudi Vision 2030. Acwa Power chairman Mohammad Abunayyan said the company was committed to the expansion of the PPP model into the power sector.